Consciousness, the human mind, is defined by neuroscience and neurosurgeons to be the result of electrochemical activity within the brain. In the view of neuroscience the firings of synapses in different areas of the complex arrangement of specialized cells and nerves that make up the brain combine to somehow produce our cognitive abilities. It is the use of this brain generated and brain localized mind/consciousness that this field of science says enables us to do such things as: find and consume food, seek shelter when necessary, procreate, and react to outside stimuli in ways that occasionally involve the flight or fight response. Without the full complex structure of the brain present, neuroscience says that there can be no consciousness, no mind, and no cognitive functions. 2. It can extend pseudo pods to act like feet, legs and arms, giving it the ability to move about and manipulate its environment. 3. 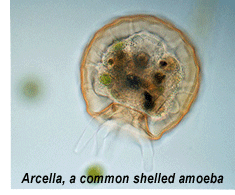 Feeding on plankton and diatoms present in the water where it lives, it can sense whether or not the particles it encounters are suitable for food, rejecting things like sand particles. When it finds a suitable food particle, such as plankton, it uses the pseudo pods to draw it in, then surrounds and consumes it. 4. It has an awareness of its orientation, and possesses the ability to right itself if it becomes inverted by exuding gas bubbles along one side, lifting that side up until it can flip over. It then reabsorbs the bubbles. All of these actions indicate a pretty capable mind/consciousness. But, if there are no physical attributes in this single cell similar to that of the human brain, no synapses to fire, and no nervous system to conduct commands from the nonexistent brain, where does it do its thinking? Most research done in the lab seems to fall under one of two classifications, Mind to Mind communication through means not readily discernable (ESP), or Mind/Matter Interaction, Psychokinesis (PK). The research is carried out utilizing the accepted standards of mainstream scientific research, and, as far as it goes, provides a valuable body of data with respect to the abilities of the human mind in the area of Extrasensory Perception (ESP). But what if reality is, not different from Newtonian Physics, but encompasses a far more extensive area than that which we can perceive with our physical senses and present laboratory equipment? First, let us set a working definition for reality as being simply “that which is”. For something to be part of reality it must just exist, no matter in what form or whether or not we are aware of its existence. It is not required that we can sense it in any way for it to exist. Before the invention of Radio Telescopes the stars and other objects in space were generating signals that were undetected by conventional optical telescopes. Up until the last century their signals weren’t even suspected by science. Now we know that these radio transmissions have existed all along and despite our being unable to detect them, were always a part of reality. Let us further stipulate that there is only one common reality, that there is not a Spiritual World, and a Material World, both real but to some extent incompatible with the other. That there is only one common reality, even if the means we use to work with specific individual areas of reality appear to be in conflict with each other. The first time I ran into this situation was in my studies of the physics of light. I found that I was required to sometimes treat light as a waveform, and at other times I must treat it as a photon, a particle possessing mass, and all the other properties that one would expect of a solid. The two sets of mathematical equations could never be mixed when working out a problem because they were incompatible, but light obeyed the rules set down in each of the two systems, as long as only one of the systems were used at a time. It is not light that existed in two different realities, but our perception of the nature of light that seemed to show that there were two incompatible realities for light. The double slit experiments, the first of which were carried out by the English Physicist and Physician Thomas Young around 1801 to 1805, were done using light and focused on the interference patterns that result from two seemingly independent beams passing through parallel slits. The result of his experiments shifted scientific thought on light for a while from Newton’s idea that light was made up of particles (photons), to the opinion that light was actually a waveform (energy oscillating from a max to a min, just like waves in a tank of water). The initial experiments were all done with beams of light, but starting in 1961 double slit experiments began to be conducted using electrons, and later with other types of particle beams. The results of the electron double slit experiments produced wave interference patterns exactly the same as the light based experiments. All types of beams exhibit characteristics that would be expected of beams made up of waveform energy, regardless of whether the beams are visible light or “solid” particles such as electrons. The conclusion has been therefore that electrons and other particles are not solids, but are waveforms, just like light. For the purposes of this article I won’t go into any details on how the double slit experiments are done, or how they have posed as many questions for physicists as answers. To do so would produce an article by itself that would be even longer that this one already is. There is considerable amount of material available on The Double Slit Experiment and the process itself is not as relevant to our discussion as much as the resulting conclusions that were based on the experiments, that is, that sub-atomic particles act like waveforms when passing through the double slits, therefore sub-atomic particles are considered to be, at least part of the time, waveform energies. As an undergraduate (some 40+ years ago), when I was introduced to sub-atomic physics (quantum mechanics) I found that I was working with dual models of the material world. One model was where everything in reality existed as either a solid, gas, liquid or energy plasma, that the basic building block of the Universe was the atom. The other was a model of reality where everything sub-atomic consisted of particles constructed of basic building blocks called quarks. Quarks have been found to be photon-like packets of energy. Therefore, in this model, all solid, liquid or gaseous matter is not solid, liquid or gaseous in the generally accepted sense, but all are in reality simply different configurations or compilations of quarks (packets of waveform energy). The solid material world, the chair you are sitting on, the body you inhabit, the entire world around you is real in every sense of the word, but the realness is derived not from a physical form, but from our perceptions of the ability of the composite energy fields of each of the atoms (which remember, are in turn constructed of packets of waveform energy, quarks) to resist the intrusion into their physical space of each of the other atom’s force fields. It is the resulting composite force fields that we perceive as solids. To restate the previous, since the material world is made up of atoms, and the atoms are in turn made up of these sub-atomic particles, and since these sub-atomic particles are in reality not like little marbles, but are packets of waveform energy, it can only be concluded that physicality is based on the effects of force fields, and that it is our interactions with these force fields that result in what we understand as interacting with solids. To illustrate what is meant by the term “force field” or more properly, the field of force that surrounds each atom, you can do a simple experiment using two bar magnets. Place the bar magnets in a line with the north pole of each magnet facing each other. Then try to move the two ends together. You will find that as the ends get closer together it takes greater and greater force on your part to make them touch. In fact, if the magnets are strong enough, you may find that you lack the strength to force them to physically touch. The resistance encountered is the result of the magnets “magnetic field” an invisible force that surrounds each of the magnets, the same as the composite field of force that is inherent in that which we call atoms. In Parapsychical Research in Psychokinesis (PK) there are two components involved. A material object, which is perceived as a solid, but as we just covered, is solid only in the sense that we perceive the interaction of force fields as solid. The other component in PK experiments is a Human Mind, generally considered in the lab as a byproduct of the living human organism. Mainstream science has literally scores of definitions for what constitutes mind, breaking the mind down into numerous categories, assigning classifications for various functions of the mind and associating those functions with different parts of the organic human brain. None of which, as far as I can tell, actually provide a prototype for understanding the energy configuration of the mind. Instrumentation can certainly indicate if there is brain activity or not, anyone who has watched a medical drama on TV is familiar with the machine readout that shows sine waves and blips scrolling across the screen, and then showing no waveforms and no blips when the brain and other parts of the body are supposed to have ceased to function in the story. But the wave patterns are not the mind itself, only a sensing of energy activity associated with a functioning mind. We can apply electrical stimulation to the memory areas of the brain to generate a specific memory in that persons mind. Every time the same cells are stimulated, the same memory is recalled. But recording the brain activity generated by the stimulated memory cannot in turn be used to convey the memory itself in any way. Nor, as far as I can tell, can there be shown any physical change in the memory cell of a brain between before and after the storage of a memory on the cell. Where is the program for the consciousness of the brain recorded? If it is a field of energy generated by the brain, where is this field stored? Taking a look at nature, how does the single cell amoeba, which as its name indicates is composed of but a single cell, know what nutrients to ingest and which ones to reject? And where is the programming stored that tells it when and how to divide into two, single cell organisms? The programming, consciousness, in both cases exists not as a component of the material cells, but as a complementary energy field, an energy field associated with, but not generated by, the organic material. Consciousness is conjoined with the brain, but is not a component of the brain. It is an independent coherent energy pattern, a composite energy waveform with a detectable, measureable associated energy field, in conventional religious terms, the soul. The key thing to understand here is that it is an independent composite, cohesive energy waveform with a detectable, measureable associated energy field. The force field of the consciousness, the mind, is not generated by the organic tissue of the brain, and is unlike the type of field that is generated by iron in the magnets in the earlier example. In the iron magnet, each of the atoms in the iron has its own force field and each of these fields have a north and south pole. In un-magnetized iron the orientation of the individual atom’s north/south poles are random, each atom’s north/south pole axis pointing in a different direction. If a coil of wire is wrapped around the iron bar and a continuous single direction of current flow (DC current) is ran through the wire of the coil, an electrical field is generated that forces each of the north/south axis’s of the atoms to line up in the direction of the field generated. Take the coil off the bar, and the atom’s axis’s remain lined up. The force field of each individual atom adds to the overall field creating a force field that extends beyond the boundaries of the iron bar, the magnetic field. Take away the iron in the iron bar and the field ceases to exist. Much of Paranormal field research revolves around the apparent ability of the human field of consciousness to remain after the removal of the organism that it was a part of. It is my belief that if Parapsychical Research in all of these areas could be conducted using not the conventional view, where reality consists solely of the material world, as the point of reference for all observations, but instead, used a point of reference in which all of reality is composed of varying forms of waveform energy, then the nature of reality will be found to be quite a bit different then it is now perceived to be. As Einstein’s Theory of Relativity demonstrates, the point from which you view reality changes the view significantly. So what is the nature of reality? Is reality then a solid material world with some as yet undiscovered accompanying energy fields hanging around, or is reality something significantly different? Is the material world real, but only in the sense that we perceive it to be material in order to simplify our ability to interact with it? Lab experiments in Psychokinesis test whether or not the human mind is capable of somehow remotely causing movement of a solid object. If the experiments were approached from the standpoint that reality is energy, that the human mind is a composite energy form that is not limited to existing as a result of, or limited to the physical dimensions of, the organic brain. If the experiments were approached from the standpoint that all of reality is composed of energy fields, some making up the atoms of the “physical” world, some energy fields making up the numerous forms of consciousness, then the experiment would be one involving not two independent models, one involving the physical world and one involving the non-physical world, but becomes an experiment using one model based on differing forms of similar waveform energy. Psychokinesis could then be tested as being actually a matter of wave theory. The movement of the material object becomes a result similar in many ways to the interference patterns that are generated between two waveforms, just as in the Double Slit Experiments, the driving waveform energy field of the human consciousness acting upon the waveforms of the energy fields of the sub-atomic particles of the elements making up the material object. The results of this and other similar experiments could go a long way towards demonstrating that the nature of reality can be defined simply as “energy”. Then we can begin the discussion on what is the source of this energy?